The EZ GRIP™ Series of putty knives, wall scrapers and taping knives are specially designed with ergonomically engineered handles to decrease hand fatigue. 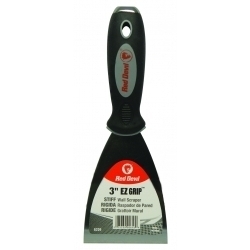 Extra-sturdy, high carbon steel blades resist rust and extend through handles for maximum strength and durability. Durable brass-plated, solid steel nail setting head can be used for setting nails and other hammering jobs.